It was a difficult time in my life. My Masters dissertation - carefully thrashed out in 6 days - was printed, handed over, gone; and with with it went any lingering sense of purpose or direction I possessed. Over the next four months of aimless post-graduate job hunting I went slowly mad, much to the dismay of my parents and familiars - but on the basis of what follows you can't say I didn't warn them. After over a month of marked, ominous silence, you'd be forgiven for assuming that I'd either forgotten all about this revived personal bloggy nonsense or died. As it happens, neither guess is far off the mark. There hasn't been a lot of time for thinking up terrible post titles or self-indulgent mumbling amid all the frantic dissertation writing, and following the associated onset of liver-destroying alcoholism I've been finding it rather difficult to get out of bed in the mornings. Fine, so maybe claiming I've died is going a bit too far, but it's still been a tough few weeks, alright?! God. 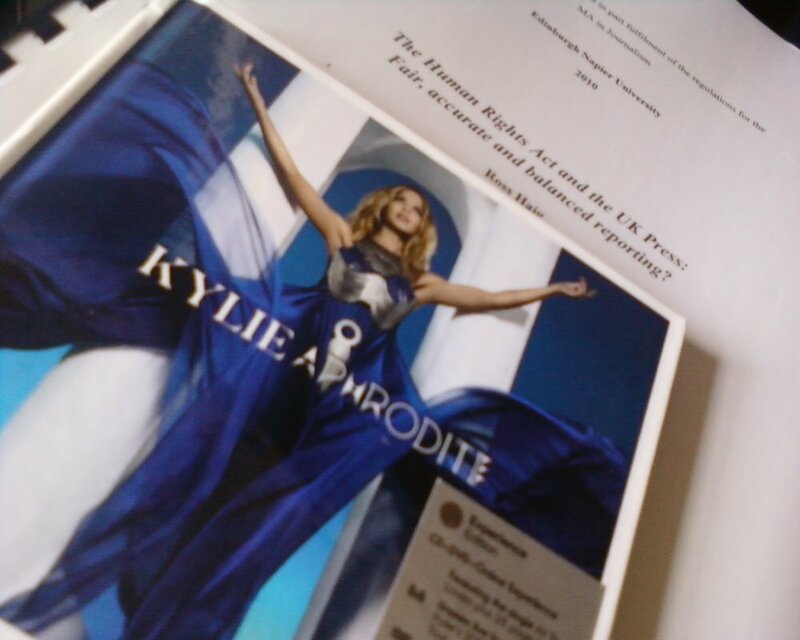 While on the subject of things I'd forgotten about, as I was polishing my bookshelf this morning I came across the special edition Kylie Minogue album I bought in a moment of pre-dissertation madness sometime last month. The hardbound collection of glossy airbrushed photos probably wasn't worth the extra fiver I flung at the self-service machine, but a vaguely Kylie-shaped sticker? HELL YES. With nothing better to do with myself, I have spent much of the last week working out where I should put it. Sadly she doesn't quite fit on the teapot. But there's just about room on the lamp. Is there a sepia landscape out there that couldn't be improved with some Kylie? ...and the giant leather hall-dwelling hippo no weirder. Seriously, why? My brother's favourite bass is definitely screaming out for some aging pop diva action, even if he refuses to admit it. But then so is the toilet. Soon Kylie really could be - wait for it - spinning around!! From the archive is a spectacularly self-indulgent feature where I trawl my many discarded former blogs - included the My Opera one that was deleted through NO FAULT OF MY OWN - for anything that suggests I was always this funny. For the purposes of this feature I am chalking up any dodgy grammar to 'that goddamn Wordpress import plugin'.